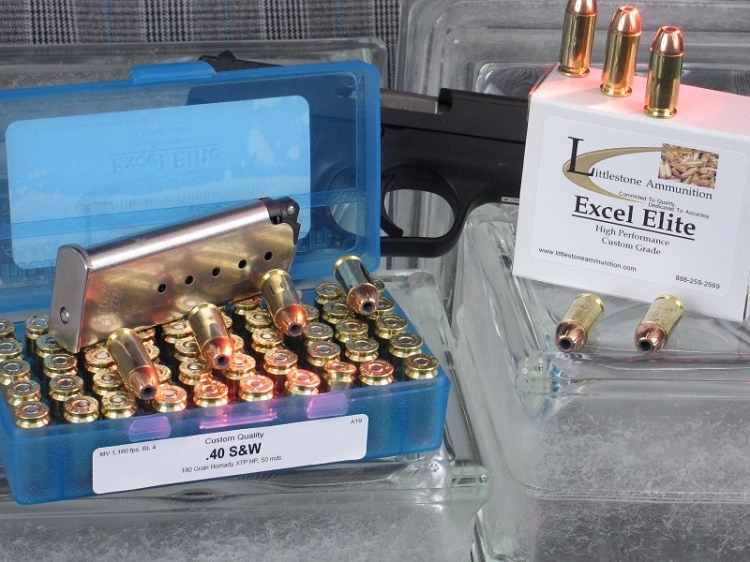 A representative example of Excel Elite .40 S&W ammunition. Item for sale may not be actual product depicted. Firearem not included. Load the power of Littlestone Ammunition for self-reliant confidence in your .40 S&W pistol. These 250 rounds of Custom-Quality Littlestone Ammunition launch a Speer Gold Dot SHORT BARREL bonded-jacket bullet at a muzzle velocity of 1,060 fps and they pack 449 ft lbs of energy, sure to ruin that bad guy?s day. Gold Dot bullets are bonded Uni-Cor hollow points, in which the jacket is built up on the lead core chemically, one molecule at a time, rather than being put in place mechanically, which can lead to jacket/core separation. The bonding process virtually eliminates the possibility of jacket/core separation. Many are intended for self defense, others for hunting. The hollow point versions are manufactured in three steps. First the core receives the bonded jacket; next an oversize hollow point cavity is installed with predetermined expansion folds; and lastly the final cavity shape and volume are set for the optimum performance for the cartridge and intended use. It typically retains about 95% of its weight through impact and is a law enforcement favorite. Short Barrel Gold Dot bullets are specially designed for use in short barreled handguns that have become so popular with the advent of concealed carry laws in most states. They have wider hollow point openings and deeper cavities and are designed to expand well at lower velocities produced by short-barreled guns. However, they also perform very well at higher velocities produced by longer-barreled guns. After you test one or more sample packs, if you and your gun like the load, come back and purchase it in greater quantities. Of course, if you prefer, use the "Add To Cart" button above to purchase this 250 rounds of Littlestone Ammunition now. Feature 3: MV / Energy / Barrel: 1,060 fps / 449 ft lbs / 4"